Who doesn't love reindeer? Everyone can agree this fun design of Santa's famous helpers clad in festive scarves and ornaments on their antlers, surrounded by candy canes, gingerbread men, and Christmas stockings, likely stuffed with even more goodies, is absolutely adorable. 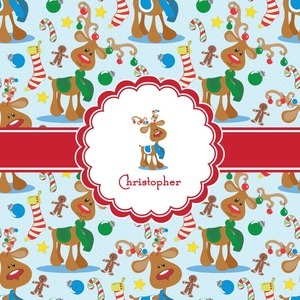 The ribbon and label are red, and the label includes a little reindeer, ready for the holidays, along with your name or text for personalization.